Welcome (back) to the Farroh Region! So for those of you who haven't yet seen my Introductions thread, I'm back! Again! And between then and now, another whole generation came out, thus making redundant even more of my ideas. Curses. In particular, the setting of Kalos. For those who hadn't already noticed, Farroh is based on England, Wales and the northern coast of France, Belgium and the Netherlands (Turn your head to the left when looking at the map!). Since Kalos was based on France, though, I'll have to slightly tweak the map of Farroh to no longer include that country - including Iolid City, which was Paris (Or rather, Kalos' Lumiose City). Within the next couple of weeks I hope to upload an improved map. I have something to show you already though! Over the past few days, I've devised a shiny new list of new Farroh Pokémon. A full list, too! Despite having to cut a few out (Including evolutions/prevolutions of old Pokémon, which seem to be no longer in fashion for new generations), I've managed to completely fill a list of new ones. There's a total of 83, bringing us up to #800. A few on this list are still quite vague designs in my head, but I have provided the typings of each of them. Take a look if you like; I'm intending (But don't count on that!) to upload rough line drawings of all of them in the coming weeks, followed (Eventually) by coloured drawings. - I've changed the grass starter (again) and the fire starter. I'm quite pleased with the new ones though. 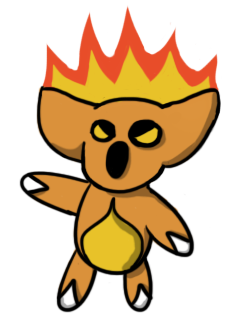 Petaby is a Grass wallaby that eventually evolves into a Grass/Fighting kangaroo, and Bratoo, the Fire armadillo, gains the Steel type as it evolves. Findol remains the same as ever, but its line is now Water/Fairy rather than Water/Flying. - Several old lines have changed type, whether entirely or partially. I doubt anybody ever memorised all the old typings, but take a look! - I've reduced the number of legendaries from about twelve (I think?) to eight: The 'version' trio, another legendary trio (Running legendaries) and two extras. Any questions about particular Pokémon on this list, do feel free to ask! Also, keep in mind the numbering is arbitrary for now; I'll probably shuffle the Dex order eventually. Hello again! For those of you who remember, I used to make up a fake region way back before Black and White were even heard of. Here is the old thread, for those interested. After Black and White were released, several of my Pokémon and others ideas became redundant since they had been done in the new games. I intended for a while to simply cut those ones out, make some new ones and carry on as I was, but I decided that, seeing as some of my designs and ideas were pretty silly/bad/unoriginal anyway, a full reboot was in order. For that matter, I give you the new thread for the Farroh region! I'll be slowly importing and revamping information on Pokémon, moves, mechanics and such to this thread over time. There's a lot missing for now, but feel free to look back at the old thread (Link above) - keep in mind though that a lot's going to change and (hopefully) improve! Last edited by Zeph; 10-22-2013 at 08:16 AM. Re: [Thread under constructon!] Welcome (back) to the Farroh Region! One of the biggest parts of this revamping of Farroh is the complete physical change of the region itself. The shape of the landmass has changed entirely, and the towns and locations have all changed in name. Peridot Town is where the player lives. A very small town, it's just a short walk away from Colepatch Beach. It is also the home of the player's friend Urma (If the player is a boy) or Silvio (If the player is a girl) lives. Piraba City is a hilly city where the player goes to school. It too is by the beach, and is at the foot of the Cycling Road, so there are often bikers passing through the city. Malcite City, with its riverside port and views of the Piraba Bridge, is the location of the first gym, found in the city's large aquarium, where challengers must face the leader Iuan's aquatic Pokémon team. Clinoclor Town is a small mining village on a plateau of mysterious Darkstone, nestled in the hills of Rainy Valley. The clinking and whirring of the machinery at its deep mineshaft fills the town. Tormalos City is renowned in all the Pokémon World for its famous steel foundry, which also houses the second gym in the Farroh League, whose leader, Frederick, trains Fire and Steel-types. Despite its industrious nature, the city is filled with parks and trees. The Carnel Institute of Pokémon Research is a leading centre of study into all things Pokémon. It serves as a town for the students who learn there. Its top researchers are husband and wife couple Professor Elaine Hawthorn, Farroh's most famous Pokémon researcher, and her partner Egbert, who challenges trainers to their third Gym battle. Carnelia City is the biggest and most bustling city in Farroh. Its tall buildings, bright lights and underground railway are what make it famous. Amongst the flashing lights and wild dancers of the Neon Club, trainers battle their fourth Gym Leader, the eccentric DJ Lyssa. 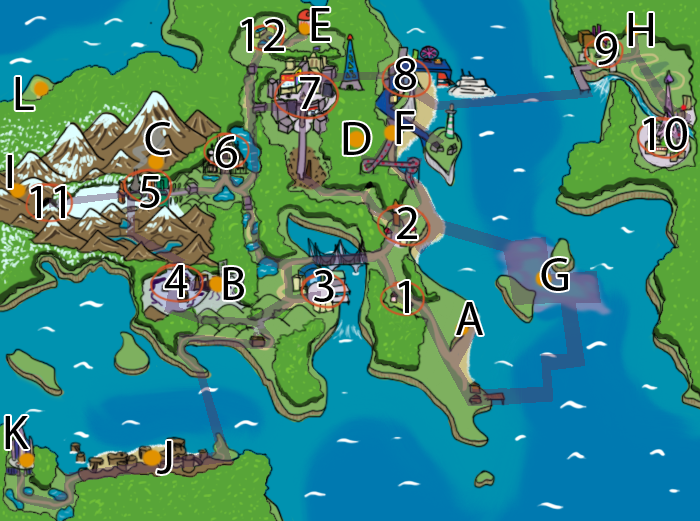 The harbour and pier of Ametrin City make up Farroh's biggest port town, boasting a colourful seaside funfair, a splendid beach and the tall Beacon Lighthouse, run by the fifth Gym Leader, Aurora. Spessar City's biggest claim to fame is its chocolate factory which ships delicious treats across the whole region. The owner of the factory is the gourmand Maurits, whose Pokémon have a passion for food. Iolid's City's name is synonymous with culture, art and beauty. The colourful lights that fill the streets and the tall, slender tower that houses the city's world-famous art museum make it a popular holiday destination - and a city very popular to trainers, too, who head to the very same museum to challenge their penultimate gym leader, the fabulous artist Vincent. Lapiville is a tiny village deep inside Lazulie Caves, a winding underground tunnel filled with softly glowing crystals. It is here that trainers find their final Gym challenge, the dragon trainer Regan. Larimar Town sits in the shadow of Farroh's Observatory, so astronomers and scientists often pass through the little village on their way up the hill. Last edited by Zeph; 11-24-2012 at 07:10 PM. A punching move that whose base damage is multiplied by 130% if the user's HP is yellow, and doubled if it is red. Animation: Large sweat drops appear on the user and fade. A trembling black fist image appears on the target with a purple flash. The user sends a dazzling blast of concentrated mind energy to contort one opponent's mind. The user must recharge the next turn. Animation: The battle background becomes solid black filled with floating grey shapes, and washed-out images of user's sprite hover and pulse around the opponent as a purple beam of light pierces them from above. The user throws a chunk of fragile metal which explodes into sharp fragments that damage one opponent. The user much recharge the next turn. Animation: The user's sprite 'leans' back before jolting forward, throwing a large chunk of metal. When that hits the target, the background flashes black and white as shards of metal rain down on the opponent. The user flies high up into the air and bombards one opponent with waves of energy. The user much recharge the next turn. Animation: As with Fly, the user vanishes up off the top of the screen, but the battle camera goes up slightly too, showing the user (front sprite), shaking and releasing waves of green energy that converge on the opponent. The user challenges one opponent to a battle of wits: If the user's Special Attack is greater than the opponent's Special Defence, the damage dealt is exactly the difference between said stats. If the opponent's Special Defence is higher, then the opponent becomes confused. Animation: Cartoon speech bubbles float from the user to the target. The target shudders, an exclamation mark appears over their head, and they too send speech bubbles back. The two sets of bubbles 'battle' each other in the middle of the battlefield, until they all pop. The user attacks all opponents with resonating sound waves. The following turn, the opponents are hurt again with exactly half the damage of the previous turn. If, before the move was first used, a sound-based move was used, the base power is multiplied by 150%. Animation: A semi-transparent of the user's sprite pulses outwards from them accompanied by a high-pitched buzzing. On the second turn, the same animation occurs, but the sound is quiet and the echo sprite smaller. The user creates a strong shield with a hard body part, such as horns or claws. The opponent's next Physical attack (within three turns) doesn't damage the user, but instead deals 25% of the damage upon the opponent who attacked. Animation: The user's sprite vibrates and stretches horizontally twice. An image of a shimmering metal shield appears over them briefly. Whips up strong winds that last 2-5 turns. 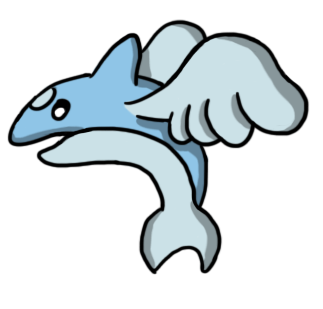 Flying-type physical moves are halved in base power (Fly itself will fail), and Flying-type special moves do 150% more base damage. Animation: Each turn, the battle background becomes foggy, and spiralling lines of wind and leaves swirl across it. The user makes one target magnetic. As such, all Steel or Electric moves by any Pokémon in battle are redirected to that opponent for five turns. Animation: An image of a red horseshoe magnet appears on the target as rings of yellow and blue electricity converge onto it. The user reverses one target's 'polarity': the target's stats are reversed for three to five turns: A new value for each stat is produced by subtracting the usual value from 255. Animation: A vertical blue and red bar magnet appears over the opponent, crackling with electricity. With a screeching noise, teh magnet flips upside-down and fades away, as the animations for sharply falling and raising stats play upon the target in quick succession. Last edited by Zeph; 11-26-2012 at 05:19 PM. Last edited by Zeph; 11-24-2012 at 06:58 PM. Last edited by Zeph; 11-24-2012 at 06:59 PM. "When it curls up when threatened, it looks like a ball of leaves. It is very timid and moves slowly." Location: Gifted to player at Carnel Institute at the start of the game. "Its tough, leafy back both protects it from harm and photosynthesises. 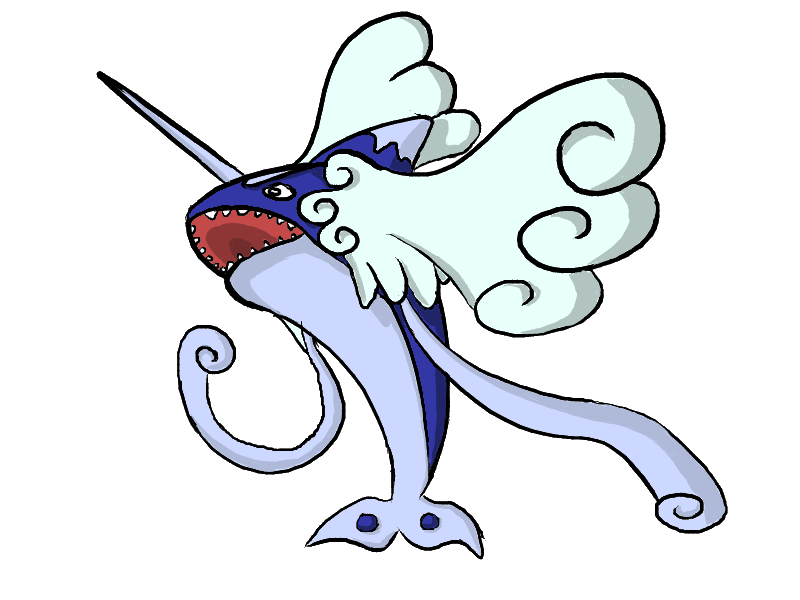 It throws its razor-sharp leaves in battle." "It uses its whiplike, rocky tail in battle to sweep foes out of the way. If hurt, it still retreats inside its shell. "The angrier it gets, the brighter the flame on its head burns. A calm Kolava is a very rare sight." "Its head is protected from its flames, but the tough fur on its torso isn't quite enough, so it still burns itself." "The tough fur on its forearms is as sharp as a steel blade. When enraged, its flames spread to its whole body." "It can both swim underwater and hover in the air. It spouts jets of water to show that it is happy." Evolves into Orking at Level 35. 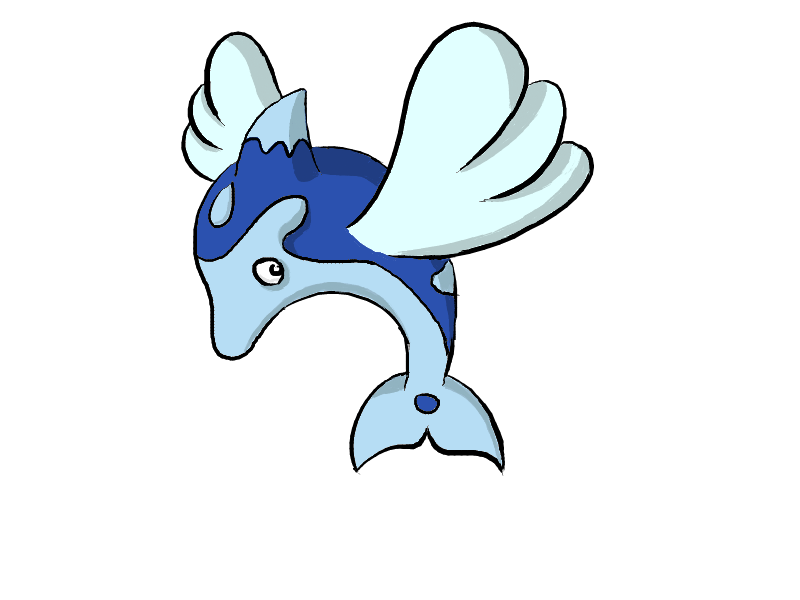 "Delprint can sometimes be seen leaping out of the ocean. They like swimming in the wake of boats." "They're said to be as intelligent as humans. When they breach the water, they look just like crashing waves." "It constantly sniffs the ground ahead of it in search for berries. Its sense of smell is far better than humans." "Highly protective of their young, Slashagruf constantly guard Snifasnuf and their berry reserves." "It gives its distinctive call on the hour, every hour, even when asleep, without fail." Evolves into Horloplume at Level 37. "When it gives its whistling call, it retracts and extends its criss-crossing tail to attract mates." "Its form and unique call inspired the design of artistic clocks. It battles foes in a flurry of feathers. "It is found on mountain slopes, where it grazes on tough grass. Its horns are hot to the touch." 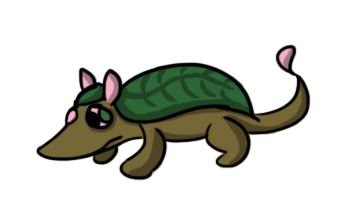 “It likes to hide amongst tall grass, disguising itself with its plantlike ears and tail. It frolics in bright sun." "It thrives in the rain, but dries up in bright sunlight. In storms, whole crowds of them can be seen." "Children who find Slochlia shells often don’t realise the Pokémon is still inside it. It damages foes with its slime." "Oblivious to the illusion created by its decorated antennae, it unknowingly scares opponents away." "The psychic waves it emits has allowed scientists to estimate the shape of the creature growing inside it." "As it flutters through the forest, it is often mistaken for a demonic, disembodied face due to the pattern on its wings." ability Egg Groups: Egg Group 1/egg group 2 Evolves into x "Dex entry"
Last edited by Zeph; 03-15-2015 at 10:12 PM. Last edited by Zeph; 11-24-2012 at 07:00 PM. In Pokémon Iron Version, the mysterious Team Quanta want to use the industrial powers of the legendary Induxon to destroy more of Farroh's precious natural landscape to make way for a vast region-wide metropolis where people and Pokémon can live together in harmony, safe from the dangers of the wilderness and protected by a Quanta-lead government. In Wood Version, Team Gaia's enigmatic leaders intend to demolish and flatten Farroh's most populous and successful cities, destroying the homes of hundreds, so that the woods and fields can return to their natural, untouched state through the power of the legendary Amoria, allowing Pokémon to live their lives in peace, undisturbed by human pollution. Last edited by Zeph; 11-27-2012 at 10:05 PM. Last edited by Zeph; 11-24-2012 at 07:01 PM. Last edited by Zeph; 11-24-2012 at 07:02 PM. Re: Welcome (back) to the Farroh Region! And there you have it! There's not much to look at at the moment, but I'd appreciate comments on the Region post including the map, and, of course, anything anybody has to say about the old thread can come here now! 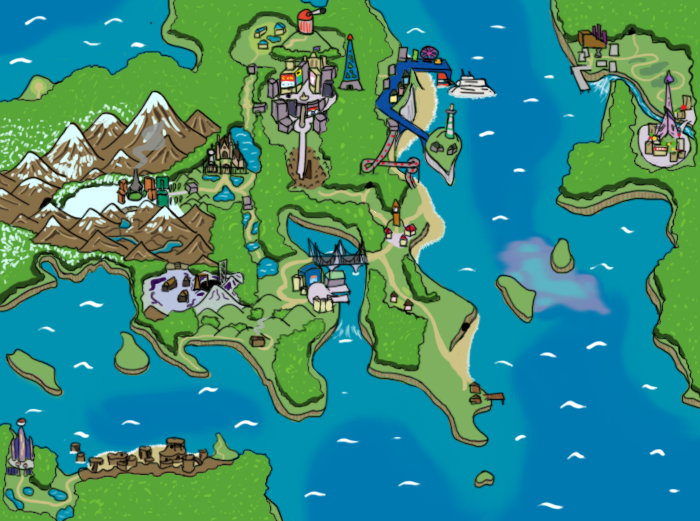 This is pretty much the best fake region map that I ever recall seeing. Wow, thank you very much! I've added the Pokédex information on the starters now too, and I'll be putting more up later today! I've updated the Pokémon post with detailed descriptions up to #665, thus adding Kooko, Pendoul, Horloplume, Snifasnuf, Slashagruf, Bilicap and Conflagot. I've also migrated a bunch of moves from the old thread. Incidentally, there's a bit about the story of the games in the Wood and Iron post too! Small update: I added a list of Routes (1-20) in the Region post and added a Location field to thee Pokémon entries. Images uploaded of the starters! What is the fire starter based on?